The root, or rhizome, of the turmeric plant has long been valued for its medicinal and culinary properties. According to the University of Maryland Medical Center, turmeric has been used in food and medicine for more than four thousand years. 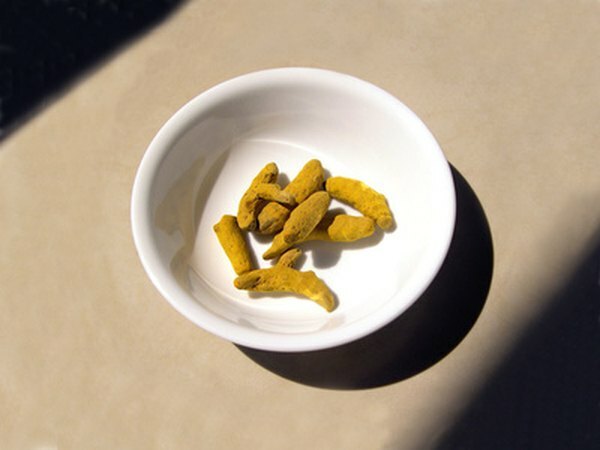 In modern international cuisine, turmeric's bright-yellow root may be used as a food coloring, seasoning or preservative. Although widely available, turmeric is not a staple in most American homes. Consider using these turmeric substitutes if a recipe calls for turmeric and you do not have access to the spice. One of turmeric's most well-known and widely available relatives, the ginger plant lends a flavor similar to its bittersweet cousin. Turmeric lacks the spicy punch associated with ginger, so ginger may cause unexpected changes in flavor when it is used in sufficiently large quantities. Additionally, ginger does not grant food the bright-yellow coloration characteristic of the turmeric spice Like turmeric powder, ginger powder is derived from the fleshy tuber of an aromatic plant. The world's most expensive spice, saffron is literally worth its weight in gold. The Epic Centre notes that saffron, like turmeric, is most commonly as a natural food coloring to give food a bright yellow hue. Saffron is extremely flavorful and fragrant, and its taste is not entirely dissimilar to turmeric. Annatto, derived from the colorful seeds of the Achiote tree, has little flavor of its own. While it can not replace the fragrance and flavor offered by turmeric, it can be an ideal substitute for giving food a natural golden coloration. The Cook's Thesaurus recommends steeping annato seeds in boiling water for 20 minutes, then using the water in place of turmeric. Another bitter, pungent spice, cumin may be used in place of turmeric when the recipe requires a bitter, slightly spicy seasoning. Cumin is a drab gray-brown in color and will not provide much visual appeal, but it can act as a viable substitute for turmeric in some recipes. Consider blending it with small amounts of ginger or garlic powder to achieve a similar balance of flavor. Turmeric is the primary ingredient in yellow Indian curries; it is responsible for the characteristic fragrance and flavor associated with these spice blends. Because curry powder contains such large quantities of turmeric, it may be used in lieu of its own main ingredient.